TE Connectivity has extended its portfolio of M12 connectors to include L-code PCB/panel types that offer a compact high-power solution for automation devices. 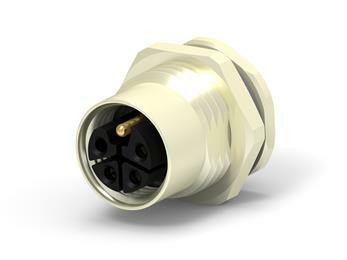 “Our new connectors take up 40% less space than Mini 7/8 connectors traditionally used for high power connections, allowing for more freedom and flexibility when designing machines and systems,” said Ruud van den Brink, TE’s product manager, Industrial Communication Europe. He adds that M12 L-code power connectors, an extension of the current M12 IEC standard, have been selected by PROFINET user organisation PROFIBUS & PROFINET International as the standard for 24 volt power supply systems used in PROFINET devices.